In a few days I’m heading to the East Coast to photograph a lacrosse tournament. Here’s a breakdown of the gear that’s coming with me. 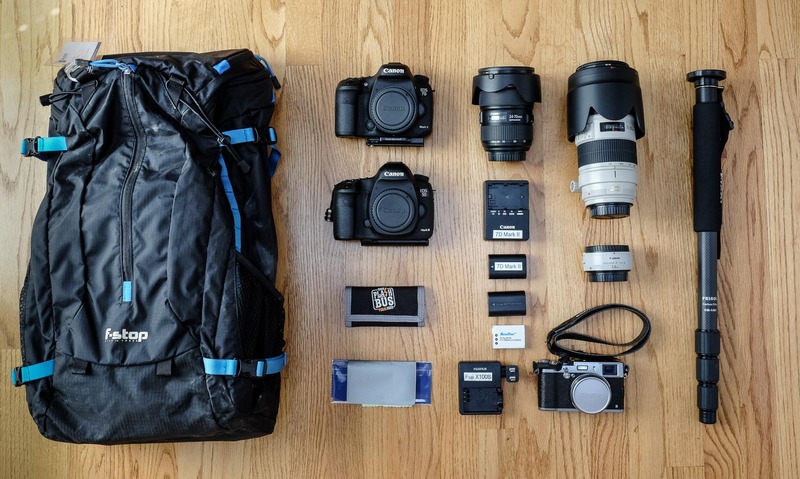 f-stop gear Loka UL: The Loka UL is my favorite camera backpack. The f-stop modular ICU system allows me to choose the right amount of camera carry space for any given trip, and the rest of the pack is available for other use. I’m using a Medium Shallow ICU for this trip. Canon 7D Mark II: The 7D Mark II is a great sports camera. A blazing fast autofocus system, 10 FPS shooting, and a 20 megapixel APS-C sensor. Both camera bodies have Really Right Stuff body plates. Canon 5D Mark III: For this trip, the 5D Mark III is a backup body. It’s a tremendous camera, and I’ve used it a ton for sports, but I prefer the high FPS from the 7D Mark II. Canon EF 70-200mm f/2.8L IS II USM Lens: My money lens for lacrosse. I can usually sit on the sideline or endline, and the 70-200 gives me lots of reach. Canon Extender EF 1.4X III: When the 70-200 isn’t long enough, the 1.4X extender helps out. Canon EF 24-70mm f/2.8L II USM Lens: For general shooting before and after the game. Works great in a crowd or with the team on the sideline at halftime. Extra memory cards, in a Thinktank Pixel Pocket Rocket. I use 32GB Sandisk Extreme Plus SD cards. Micro fiber cleaning cloths: These are cheap. I use them liberally for cleaning cameras and other bits of gear. Spare battery for 7D Mark II: Works fine in the 5D Mark III too. Fujifilm X100S: For side trips, team dinners, and other happy snaps. Battery charger for Fujifilm X100S. I replaced the Fuji cord with a spiffy little right angle plug adapter. Feisol CM-1401 Monopod: For sports, I use a monopod 90% of the time. It keeps the camera steady, and saves my arm, shoulder, and back muscles.